Last weekend the big event was the 15-km Grande Digue. This is a race with a tradition of both inclusion and excellence so the winning times are always impressive. In the men’s 15-km the leader was Lee Wesselius of River Glade in 50:32 ahead of Alex Neuffer of Stratford PEI in 51:12 and Kyle Smith of Halifax in 52:30. The women were led by Sacha “The Beast” Hourihan of Southfield in 57:43 for a convincing win over a pair of Moncton runners who had a real race for second place, Rochelle Johnson (1:01:26) and Anouk Pelletier (1:01:48). At the 5-km distance the women’s event was won by Josianne Guay of Edmundston in 20:31 followed closely by Dartmouth’s Stacy Chestnutt in 20:43. Third place went to Sylvie Leblanc of North Tetagouche in 24:43. The men were led by Vince Leclair of Balmoral in 18:41 ahead of Maxime Aube of Dieppe (20:38) and Adam (last name missing from results) of Shediac River in 22:49. The 15-km walk for men was won by Pierre Godbout of Grand Digue in 2:16:17 ahead of Louie Richard of Moncton (2:41:59) and Alan Belleville of Shediac (2:42:29). The women’s 15-km walk was dominated by Dieppe walkers, Gisele Devarennes (2:07:57) Charline Richard (2:11:44) and Julie Richard (2:13:34). One of the great programs of Run NB that we don’t report results on because of the philosophy of the program is the Small Strides, Healthy Lives running program for kids sponsored by the NB Medical Society. This program offers medals for all kids who participate in events offered in parallel with adult runs around the Province. Last week the 15-km Grand Digue and this weekend’s races A Beacon in the Night and Warm Hearts Half marathon all offer the Small Strides, Healthy Lives events for the kids. Kudos to the run organizers for including this very important program for kids. This week our Person on the Run goes to an amazing man from Tracadie. 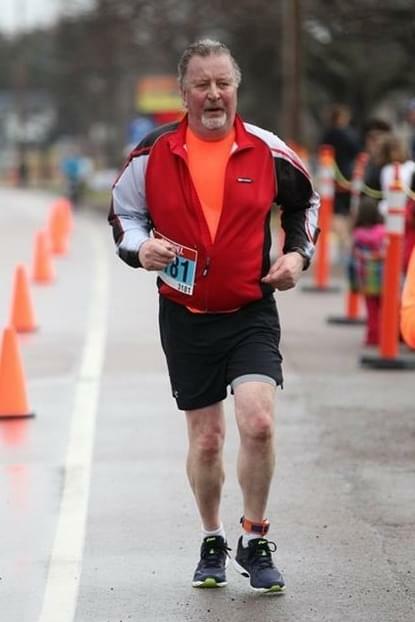 Donald Wade is the race director of the Demi-Marathon de l’Acadie every month no matter the weather. But this past weekend he laced them up and took on the 5-km in Grand Digue. 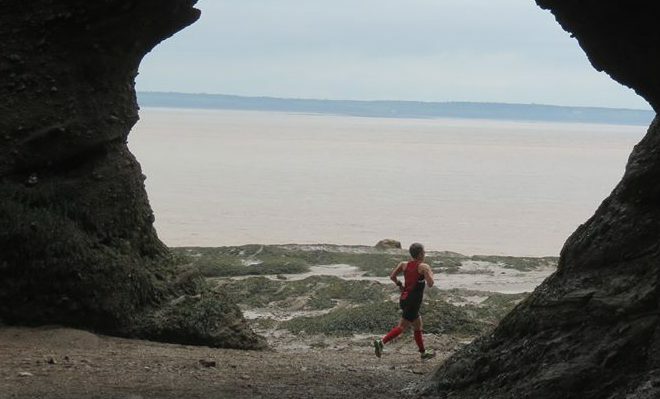 Another example of what makes our running community in New Brunswick so great. Merci Donald.